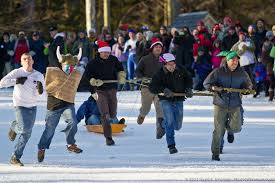 The Human Dog Sled Race will be held Friday night, February 8, 2019, at Satre Hill (Ski Jumps), Indian Cave Road, Salisbury, CT 06068. The event is part of Jumpfest 2019 (see Jumpfest profile) and is sponsored by the Salisbury Winter Sports Association (SWSA). The Human Dog Sled Race begins at the conclusion of the Ski Jumping Under the Lights (approximately 8:30 pm). The entry fee is $25 per six-person team – admission fee is waived. The admission fee for spectators is $15 per person, children 12 years old and under are admitted free. The Human Dog Sled team consists of six people- five pullers and one rider pulling a sled of the team’s own design. The course is approximately 3/10’s of a mile long, using the outrun (the expanse where jumpers come to a stop). Teams compete in timed, two-team races, and the two fastest times in each category will run a second race for the trophy. There will be three categories: men, women and mixed (at least one female puller). Ticket booth for Jumpfest opens at 6:00 pm. Team members should arrive early enough before start time to allow for organizing people and equipment, signing in and paying. Event begins approximately at 8:30 pm, depending on when ski jumping ends. Awards after race completion. Trophies will be awarded to first place winners for men, women and mixed divisions. There will also be a People’s Choice award for the best sled/ costume design. Important notice: This event comes with risk. Participants should be reasonably fit. Also, occasionally during a race, a puller may fall and their sled may strike or slide over them. Although teams have wide latitude in designing their sled, please consider using a smooth bottomed design or better yet an air-filled design such as a large inner tube which would be less painful than a steel runnered sled, for example. The harness design also deserves consideration. A system where a falling puller can simply “let go” is preferable to a harness where all pullers are “locked in”- if they fall, they get dragged by the other pullers. All team members must sign a liability release. New entrants should email info@jumpfest.org for more information. To pre-register, again email info@jumpfest.org. Proceeds from the Human Dog Sled Race will benefit SWSA’s junior ski programs. For more information about jumpfest or SWSA visit jumpfest.org. If you live within sportingAcause’s territory – Pittsfield, MA down to Harwinton, CT and over to Poughkeepsie, NY, then you are pretty much a hour away from two amazing winter sports events within a 10 day span. Beginning Thursday, Jan. 31st through Sunday, Feb. 3rd you can witness an honest-to-God curling Bonspiel at the Norfolk Curling Club in Norfolk, CT.
Then, four days later, Friday evening of Feb 8th through Sunday the 10th, you can see the equally amazing and exciting ski jumping during Jumpfest in downtown Salisbury, CT. Curling first caught American attention several Winter Olympics ago when the sport inexplicably enjoyed a lopsided dose of TV coverage- what is this thing, curling? Well you’ll have a chance to find out up close next weekend. You will be able to view the action in the comfort of the Norfolk Curling Club’s new state-of-the-art facility, as you snack and perhaps partake of a cocktail. And there will be many curlers nearby happy to answer any questions you have about the sport. Now the following weekend you’ll get to see a different kind of winter sport- ski jumping at Jumpfest 2019 at the Satre Hill 65 meter tower in Salisbury sponsored by the Salisbury Winter Sports Association (SWSA). But listen closely – If you have not witnessed ski jumping live, you have not seen the sport. These young athletes, some as young as 12, exit the tower’s take off at 50 miles an hour, travel upwards of 200 feet through the air and land, skis slapping on the landing hill right before your eyes. The crowds register their enthusiasm by cheering and ringing cowbells, and you will be one of them. And another thing- jumpers you see up-close-and-personal in Salisbury will be in future Olympics- they are that good. Sunday will feature the Eastern U.S. Ski Jumping Championships. There will be plenty to eat, beverages from hot chocolate to hot toddies, with bonfires and lots of camaraderie. Adult admission is $15 but children 12 and under get in free. Get all of the details for both events here at sportingAcause.com. So there you have it- two cures for the mid-winter blues.